Hallyu star Jang Geun Suk made public the photo with Girls’ Generation member YoonA. 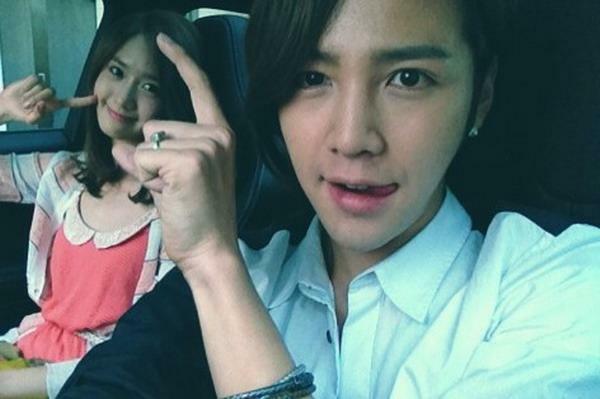 On the afternoon of May 19th, 2012, Jang Geun Suk tweeted on his personal Twitter account, “The photo with YoonA. The face of YoonA is realy small. Has got the agreement of YoonA to upload the photo.” And he uploaded a photo. In the photo, YoonA pointed at her own face, revealing a lovely smile, Jang Geun Suk made use of illusion over perspective of distance to capture the photo where he was as if completely grabbing the head of YoonA, and showed her tongue, the photo is very funny. Netizens commented on the photo, “The two persons are like in the filming, come on!” “YoonA looks like an angel, it’s good to be able to costar with YoonA,” “I am seriously watching ‘Love Rain’, the face of YoonA is really small,” and so on. YoonA and Jang Geun Suk star in KBS2 drama series “Love Rain” as a sweet couple.